Downtown Minneapolis Hotel and Skyway Map: This super useful map is worth downloading and printing to help you get around. Sessions will be at the Hilton Minneapolis Monday-Wednesday, and at the Convention Center Thursday-Saturday. Light Rail: Light Rail is accessible from both the Humphrey and Lindbergh Terminals at the Minneapolis/St. Paul International Airport. Follow signage towards “ground transportation”. Route 55 services downtown and runs every 7.5 minutes during rush hour and 10-15 minutes during non-rush hour. Travel time is approximately 25 minutes and fares vary between $1.75 - $2.25. Proceed to the Nicollet Mall Station (5th Street & Nicollet). Take the “Free Nicollet Mall Bus” to the 11th Street stop (11th Street & Nicollet). Walk one block east to 11th and Marquette Avenue. Hotel located on corner of 11th Street and Marquette Avenue. Taxi: Taxi service is accessible at both terminals. Taxi service at Terminal 1-Lindbergh is accessible via the Tram Level (Level T). Signs direct passengers one level up to the taxi starter booth, where airport staff will assist passengers in obtaining a taxi. At Terminal 2-Humphrey, taxi service is available at the Ground Transport Center, located on the ground level of the Purple parking ramp directly across from the terminal building. Downtown Minneapolis is approximately 12 miles from the airport and travel time is approximately 25 minutes depending on traffic. Fares vary between $38-$49 each way. A $6.75 fare will be displayed on the Taxicab meter at the onset of your trip, this fee includes a $2.50 flag drop and a $4.25 Airport access fee. Shuttle: SuperShuttle is a ride-share van service to and from the airport. Ticket counters are located in the Terminal 1-Lindbergh Ground Transport Center, accessible via the terminal's Tram Level. Follow the signs to the appropriate escalator or elevator up. Shuttles drop off travelers near the Green and Gold parking ramps across from the Lindbergh Terminal. From there, you can take an escalator or elevator down to the terminal's Tram Level (Level T) or up to a skyway to Ticketing. Travelers arriving at Terminal 2-Humphrey can call for pick up at the Super Shuttle kiosk in the Ground Transport Center, located on Level 1 of the Purple parking ramp across from the terminal building. Advance reservations are highly recommended. You may also book online at http://www.supershuttle.com/. The fare is $16.00 each way and travel time varies depending on the number of passengers, but is usually 30-45 minutes. 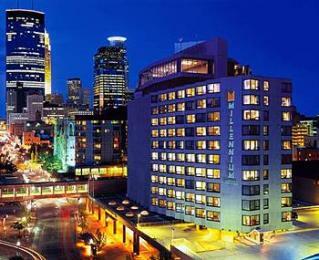 Hotels: Sessions at Evaluation 2012 will be held at the Hilton Minneapolis, located at 1001 Marquette Avenue South, Minneapolis, Minnesota on Wednesday and the Minneapolis Convention Center, located at 1301 Second Avenue South Minneapolis, Minnesota on Thursday, Friday, and Saturday. 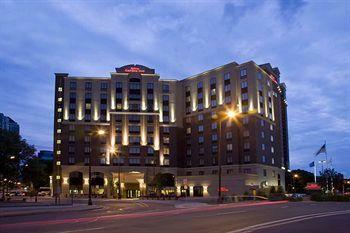 All Hotels are located within a short walk to the Convention Center. AEAs pre-reserved room blocks are now SOLD-OUT. We are leaving the contact information and links up below for the AEA's Housing Department for reference for those who have reservations. Please do not call the AEA office directly. If you have NOT yet reserved your room, we recommend you search www.hotels.com (or another hotel search site) or call your local travel agent. Please make sure you check the distance to the convention center (or directly from Minneapolis Convention Center) and read the reviews so that you can gain an idea as to the quality, look, and feel of the properties available. The Hilton Minneapolis is the headquarters Hotel for Evaluation 2012 and is conveniently connected to the Minneapolis Convention Center via the Skyway. The hotel boasts stunning skyline views and an ideal location, nestled in the center of Minneapolis. Enjoy delicious Midwest cuisine and the comfortable metropolitan atmosphere in the hotel’s restaurant, SkyWater Cuisine and Cocktails. Meet with friends or colleagues for a relaxed evening drink and enjoy delicious appetizers, classic drinks or exotic cocktails. Rejuvenate in the hotel’s fitness center or enjoy a refreshing swim in the hotel’s indoor pool. Relax in the sauna or whirlpool after a long day. Each room is beautifully decorated with hand-carved oak and warm, rich hues of ambers, reds and tans. Each guest room offers a 32" HDTV, alarm clock radio with MP3 connection, wireless high-speed internet, work desk with a Herman Miller chair, two-line phones with voicemail, LavAzza Coffee, iron and ironing board, and hair dryer. The Serenity Bed includes an exclusive Suite Dreams mattress, down-filled comforters, down pillows, luxury sheets, along with custom decorative bed throws and bolster pillows. Stunning Minneapolis skyline views and the latest amenities provide class and comfort for creating that ultimate retreat. Ask for reservations, and request to book into the American Evaluation Association room block. Housing Bureau hours are Monday-Friday, 9am-3pm ct. Cancellation: Cancellations after September 21, 2012 will be charged and/or forfeit a $25.00 cancellation fee. Cancellations within 72 hours prior to the day of arrival will be charged and/or forfeit first night's room and tax. Parking: Daily guest valet parking: $23.00, daily self parking: $13.00, for a 24 hour period (in/out privileges; fees subject to change). Internet: All guestrooms offer wireless high-speed internet capability. The cost is $13.95 (tax included) for a 24 hour period. Health Club: Yes, free to guests. Tip: The Hilton features PURE Allergy Friendly guest rooms which provides an allergy friendly, healthy alternative for every guest. The Hilton Garden Inn is conveniently located across the street from the Convention Center and approximately two blocks from the Hilton Minneapolis. Stay in a spacious guest room, which feature contemporary decor and include complimentary high-speed internet access. Enjoy a restful night on 250 thread count sheets. Keep up with work at the large desk with ergonomic chair, and unwind at the end of a long day with your favorite shows on the 37-inch flat-screen TV. Swim laps in the hotel's indoor swimming pool and keep fit in the fitness center with both cardiovascular machines and weights. Borrow a Stay Fit Kit® from reception to work out in the privacy of your own room. Start each day with a delicious cooked-to-order breakfast at the Great American Grill® restaurant, or pick up supplies at the 24-hour Pavilion Pantry® convenience store. This Minneapolis hotel also offers a fireplace in the lobby, and dry cleaning/laundry services. Parking: Daily guest valet parking: $24.00 for a 24 hour period (in/out privileges; no self parking; fees subject to change). Smoking: The hotel is smoking (1 floor)/non-smoking. Tip: The Hilton Garden Inn offers a complimentary area shuttle and train station pick-up service to all guests. The Holiday Inn Express & Suites is conveniently located one block from the Hilton Minneapolis and the Minneapolis Convention Center. You can stay productive with free high-speed, wireless Internet access and a spacious work desk. For some downtime, kick back on the triple-sheeted bed and watch a movie on the 32-inch flat panel TV. Hotel amenities include guest laundry, concierge, fax/photocopy services, laundry/dry cleaning, free local telephone calls, gift shop, ice machine, newsstand, and safe deposit box. Guests may also enjoy the indoor pool, whirlpool, and fitness center. Guest rooms feature satellite/cable TVs, coffeemakers, hairdryers, high-speed Internet access, in-room movies, irons, ironing boards, individual climate controls, telephones, and voicemail. Be ready for everything there is to do in Minneapolis with the hotel's free, hot Express Start Breakfast Bar. Parking: Daily self parking: $12.00 for a 24 hour period (in/out privileges; fees subject to change). Tip: Holiday Inn guest can enjoy a free, hot Express Start Breakfast Bar. Cheese omelets, bacon, sausage, cinnamon rolls and much more are served daily. You can even have a continental breakfast delivered to your room at no charge! The Hyatt Regency is conveniently located approximately a block from the Convention Center via enclosed skyway and one and one-half block from the Hilton Minneapolis. Guests will enjoy a striking new lobby, luxurious new guestrooms and suites and a brand new restaurant and market place. The city’s newest culinary hotspot, Prairie Kitchen & Bar, specializes in Scandinavian-inspired, locally grown and seasonal cuisine. Enjoy amenities such as a full-service Business Center and recently renovated state-of-the-art StayFit™ Athletic Club. The oversized and luxurious guestrooms offer exhilarating views of Loring Park or the stunning city skyline. Experience deluxe amenities, including an oversized work desk, Wi-Fi, and luxurious bath with pampering Portico products. Drift off to a restful sleep in the supreme comfort of two double Hyatt Grand Beds™, with sumptuous linens, plush duvet and elegant throw over pillow top mattresses. Parking: Daily guest valet parking: $28.00, daily self parking : $17.00 (garage not owned by Hotel), for a 24 hour period (in/out privileges; fees subject to change). Internet: All guestrooms offer wireless high-speed internet capability. The cost is $9.95 (plus tax) for the "economy connection" for a 24 hour period or $12.95 (plus tax) for the "business connection" for a 24 hour period. Tip: Hyatt offers Respire Hypo-Allergenic Rooms which are designed to provide a comfortable sleeping environment for all guests, especially allergy sufferers. Insider Tip: The free fitness center here is state of the art - it used to be part of a large athletic club. Their common spaces in the fitness center are spa-like (a great place to get away even if you aren't working out). This is the place to stay if you are a fitness buff. The Millennium Hotel is conveniently located behind the Convention Center and accessible via the Skyway and approximately two blocks from the Hilton Minneapolis. Guests will find one of the best Minneapolis restaurants here, Nics on Nicollet. An eclectic multi-course menu favors regional comfort foods with a contemporary influence, complemented by an international wine selection. Unwind in the contemporary setting of Martini's Lobby Lounge while indulging in one of the signature martinis, which include Ocean Wave and Very Cherry. Guests can also try one of the innovative appetizers, sit back, and watch the latest world news or sporting event on the 42-inch plasma screens. Each hotel room is equipped with a variety of features, such as ottomans, work desks and premium mattresses, high-speed Internet access, large desks with ergonomic chairs, rich cherry-wood furnishings, gourmet coffee, and angled windows that open fully. Parking: Daily guest self parking: $16.00, for a 24 hour period (in/out privileges; fees subject to change). Health Club: Yes, free for guests.